Your expectations determine your reality. Don't try to fix anyone. Searching for a life blessed with peace and happiness? Longing to move past old expectations and learn to live in the moment? 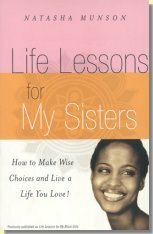 Life Lessons for My Sisters offers warm encouragement and refreshingly straightforward guidance for women who want to live a more meaningful life. Author and motivational speaker Natasha Munson wrote this book to help young black women avoid many of the pitfalls she encountered on her path to adulthood, but her sage advice on how to live a life you love resonates equally with seekers of all ages and backgrounds. In pithy, inspirational chapters, each concluding with a wise observation about life, Life Lessons for My Sisters tells it not only like it is, but like it should be.